As an athlete, you are probably even more confused trying to figure out the best way to "fuel" for optimal training and racing. Should you go high-carb low-fat, low-carb high-fat, paleo, vegan, or some mix of all of these? Is there a "secret" food or fuel that will propel you to faster racing and a PR? So many questions, and lots of confusion! We believe a daily diet that leads to optimal health, longevity, and fast racing, is largely about BALANCE and MODERATION, and should be comprised mostly of a variety of whole foods, very few if any processed foods, foods balanced in macro-nutrients, plenty of rich sources of fat (especially good fat), and foods lower on the glycemic index. This quote says it all: “Don’t eat anything your great-grandmother wouldn’t recognize as food!” There’s a lot of truth to that! The best way for each of us to eat is largely personal. We all need to find what will work best for us individually. Some do better on higher carbohydrate diets and others feel better on lower carbohydrate diets. If there IS one recommendation we could stand firm on, it is that good daily eating starts with removing unwanted sugar, processed junk foods, and artificial stimulants from our diet, not by adding more stuff, particularly junk. Eating Well: Our friends at Tri-Hard Sports Conditioning wrote a great article entitled "Eating Well." In that piece, they shared these thoughts: "When was the last time you really enjoyed eating? Do you often rush through meals so you can get to the next thing? Are you preoccupied with whether a food is good for you or not? It’s time to bring the fun back into eating and we’re here to help. Picture this. You’re at the counter chopping up some fresh vegetables you picked up a few days before at your local farmers’ market. Your best friend is rubbing some spices on a few pieces of fish. You can smell the grill heating up as you listen to your favorite music. You share great conversation as you prepare and soon sit down to this delicious meal. You enjoy every bite and feel nourished by the experience. This is eating well! This is in contrast to grabbing something on your way out the door or obsessing over every detail of nutrition. Eating well is a concept that blends “good nutrition” with the simple act of eating great meals with your family and friends. Eating well empowers you to get past means-to-end thinking and returns eating to its rightful place as one of life’s simple pleasures. 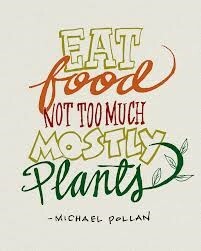 Rest assured, when you eat well you get all of the benefits of “good nutrition”, and even more, since you are free of the food neuroses that make eating stressful and spoil the fun." That's great advice, don't you think? So, in summary, here are some general bullets to guide you. Eat real food, not processed food. Eat amounts appropriate given your training volume and intensity. Avoid seeing food as stress relief or a way to cope emotionally. Experiment, keep an open mind, and learn. When it comes to meal timing, experiment to find what works best for you. Keep a diary to learn more about your habits. Begin hydrating when you first wake up by drinking at least 1 full glass of water. Drink as much water as you can reasonably stomach before going to bed. Make good food choices as often as possible, vs. avoiding certain foods. Be flexible each day, and don’t beat yourself up if you make an occasional poor choice. Get the majority of your nutrition from fresh vegetables, whole fruits, and quality lean protein. Limit starch and sugar intake to those time periods during and /or immediately after long rides and runs. Consume a minimum of 3-4 grams a day of Omega-3 fats from fatty fish or a quality supplement. We hope our chat today on the podcast about all things food and falacies, is helpful. Have a great day everyone and enjoy eating well!